I love squid season. It’s the first real sign of spring in New England. As the weather warms, the squid are abundant off the coast of the Cape. As summer arrives we move into black bass season, then stripers, bluefish and tuna. These iconic New England species follow the squid for food and make up our region’s epic summer fishing catch. But squid isn’t high on the amateur angler’s list—it’s best caught in trawling nets, so we leave squid fishing to the commercial boats, a big and important industry in the Northeast. The local squid industry was steady through the 1970s, the catch mostly exported to Asia and Europe. But soon after the Vietnam war, Chinese and Southeast Asian immigration increased exponentially, followed by a boom in Asian restaurants serving squid to their patrons. By 1975 an Italian-style squid recipe appeared in the New York Times promoting it as an inexpensive and seasonal catch worth trying. Americans had gotten a taste for it and squid’s ubiquity on menus across the country took hold. Today the bulk of the domestic Atlantic squid is caught miles off shore, with large trawlers dragging nets through the water to trap them. The squid fishery is managed by the National Oceanic and Atmospheric Administration (NOAA), which sets quotas and delineates the season for commercial squid fishing. In Massachusetts, that season is short, April 23 to June 9, and the majority of this fishing happens off Nantucket, Martha’s Vineyard and Cape Cod. In 2018, Massachusetts reported 1.6 million pounds of landed squid. 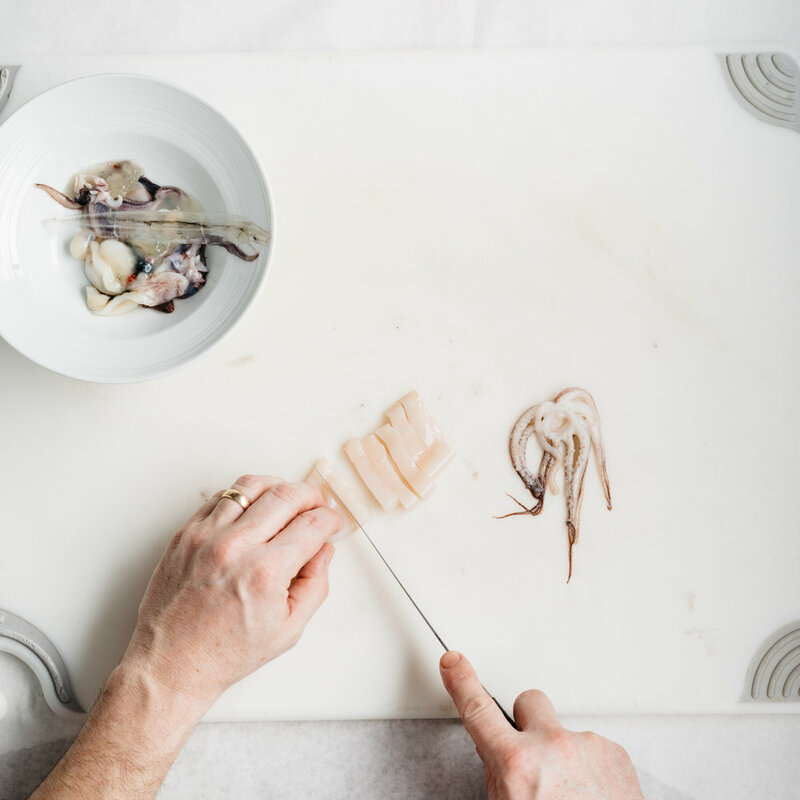 We’re lucky that most of the New England catch is longfin squid, or loligo, considered the best quality genus for eating. As the squid market is a volume game for commercial fishermen, the price paid can vary depending on a variety of factors, like the strength of the global economy and how much squid is caught in a given season. Most in-state fishermen don’t concentrate solely on squid, but focus on it when it is plentiful, switching to another species as the catch slows or the season ends. A good fisherman with the right equipment can catch over 10,000 pounds in a day. The domestic squid fishery is considered to be in good shape from a sustainability standpoint—NOAA considers the population healthy, and as a species it checks most of the boxes for what responsible seafood buyers look for. In theory, Atlantic squid is local, sustainable and good eating. But like most fisheries it’s not always that straightforward. Much of the squid caught offshore here is frozen immediately and shipped directly to India or China. There it is thawed, cleaned and usually treated with a chemical to give it a longer shelf life. It’s then re-packed, frozen again and shipped back to the U.S. 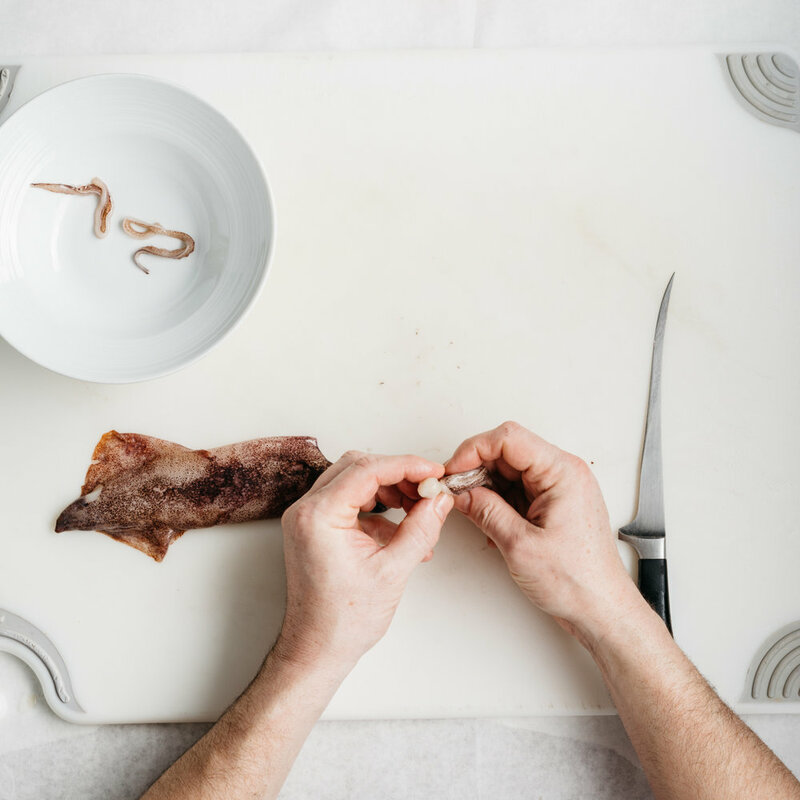 Most of us are eating this squid when we buy it from inexpensive chain stores or restaurants: Squid flesh is resilient when defrosted, and the processing does little to affect its flavor, so how would we know? It’s not “bad” per se, but it’s certainly misleading when a menu tells you you’re eating “native” seafood; sure, it was caught here, but then it took a long trip abroad for processing to keep (already low) costs down. Not exactly what you’d call “local,” especially from a carbon footprint standpoint. 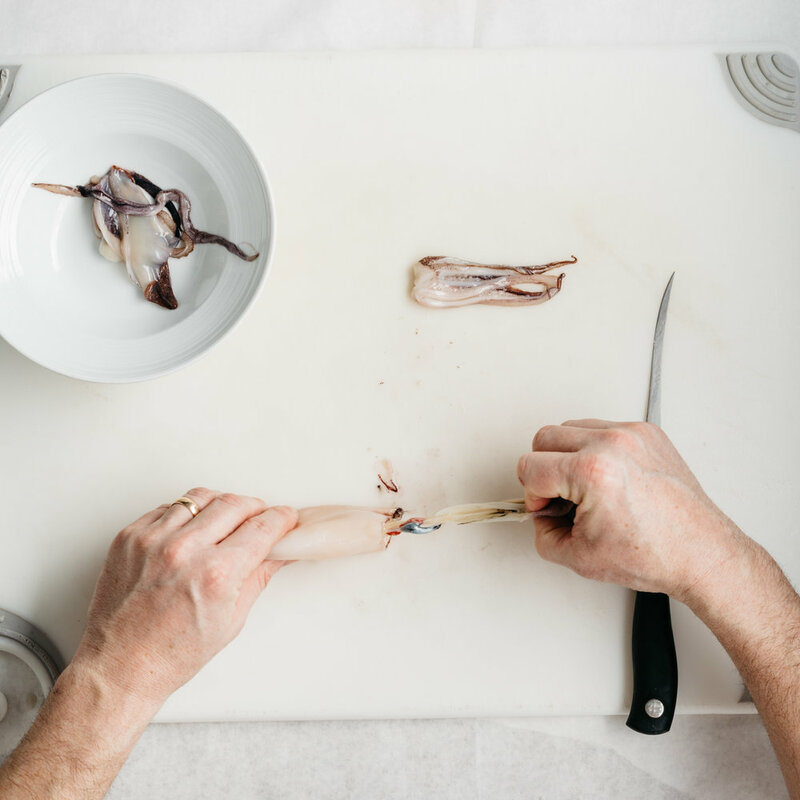 There is some squid processed in America, and the label will usually say “Domestically Caught and Domestically Processed,” so be sure to look for that standard at the market. The squid fishery is a balancing act: It must harvest seafood at a large volume but also make sure there is enough left for the future. It continues to offer an opportunity for fisherman to make a living on the ocean even if they’re not catching more tradition - al species. The price and quantity of squid has stayed strong so there remains an abundance of squid to be caught. So we should be eating more squid! But how does the general public get its hands on squid straight from the fishermen, before it’s shipped off to Asia to be processed and returned? Many good fish markets will sell “dirty” squid in season, which is squid that has been left whole and uncleaned. 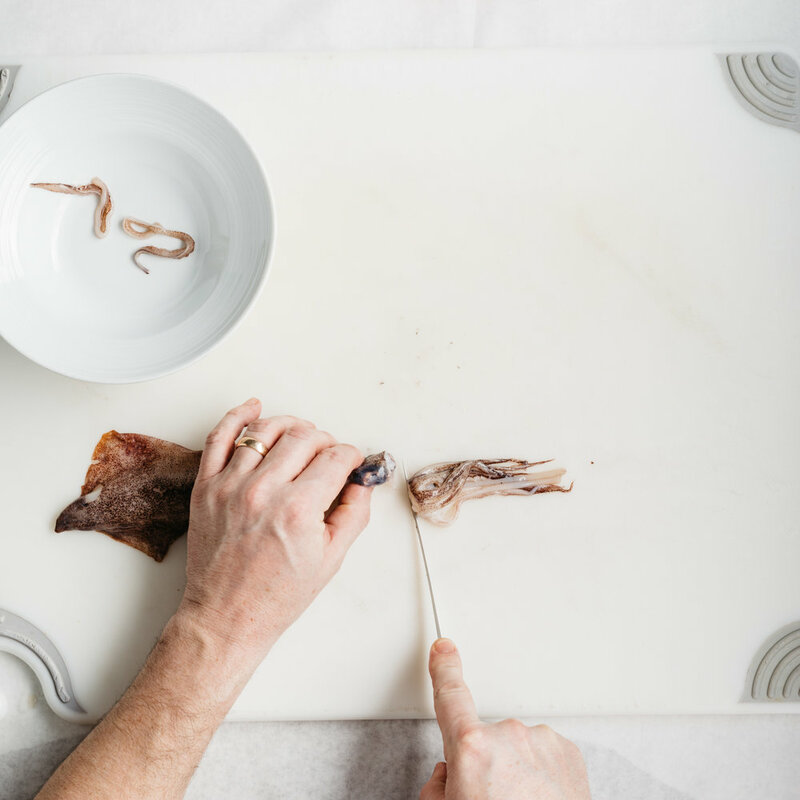 Most people wouldn’t know what to do with a whole squid when they got it home, but it is really pretty simple to clean and very satisfying (though messy) to accomplish. It does not need advanced knife skills and unlike most seafood, it has no bones. When buying squid it’s like buying any fresh seafood: It should have no smell, an overall good appearance and still have color to it. I buy as much fresh squid as I can in season and love teaching new cooks how to clean it, a memorable experience for them. Fried squid—or calamari, as it’s generally known—is so common that it’s hard to remember a time before the golden-fried cephalopod was on nearly every restaurant’s menu. It’s as generic as Caesar salad, an easily recognized food, its versatility guaranteeing it’s found as often at chains like Olive Garden and Red Lobster as it is at Legal Seafoods and my own restaurants. The reality is most people still love their squid fried, and honestly it is really good that way. I like crunchy rings as much as the next guy, although approaching squid differently can really expand diners’ appreciation for this sustainable, local seafood. I’ve had fun working on new squid dishes over the years at Row 34 and Island Creek Oyster Bar, and they’ve been received really well there. But getting people to cook and eat more squid at home is a challenge; I’m hopeful these four interesting and home-cook-friendly recipes can help change that. Squid is low in fat, high in protein, takes on the flavors it’s cooked with and is as easily adaptable to Mediterranean flavors as to Asian ones. It’s enjoyed around the world, from Italy to Vietnam, Spain to Japan, because it’s both tender when cooked quickly and forgiving when stewed or braised. It’s just as good straight off the grill with a squeeze of lemon—tentacles charred and bodies curled—or chilled in a salad with marinated beans, herbs and lots of olive oil. Above all, by asking your local fishmonger for “dirty” squid you can help demonstrate there’s a market for it. If enough of us New Englanders want fresh squid, straight from our local fishermen and not shipped around the globe for processing, we can help reduce that wasteful practice. Use my tips below for breaking down a whole squid and start enjoying this inexpensive, delicious local seafood at home. EDITOR’S NOTE: For more on underutilized seafood and sea vegetables, pick up a copy of Simmering the Sea by Sarah Schumann, Kate Masury, Marie-Joëlle Rochet and Rizwan Ahmed. This sweetly illustrated book highlights more than two dozen under-appreciated species of the Northeast Atlantic, along with recipes for how best to cook them, tips on filleting both flat and round fish and suggestions for how we as responsible eaters can best harvest from the sea and protect the underwater ecosystem at the same time. Produced through a partnership between the University of Rhode Island, the nonprofit Eating with the Ecosystem, the French Research Institute for Exploitation of the Sea and Johnson & Wales University College of Culinary Arts, you can find the book at eatingwiththeecosystem.org. Remove the 2 longest tentacles, discard. Remove the head just below the eyes. Remove and discard the 'beak' and eyes; set tentacles aside. Hold pointed tip and pull off the outer skin. Remove and discard the skin. Pull out the long clear cartilage spike; discard. Using your knife, scrape outside of tube to squeeze out innards; discard. Clean out any remaining "stuff" inside. Slice into rings.